visibile in this scale, next to Culebrita. 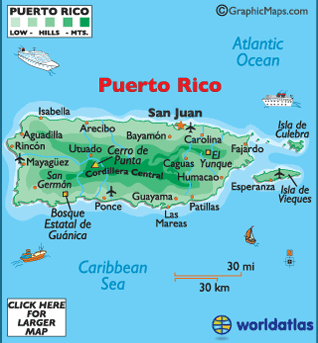 In case there was any doubt, Dewey and Flamingo are places, not people, in the not that well-known out islands of Puerto Rico, “marketed” as “The Spanish Virgins. 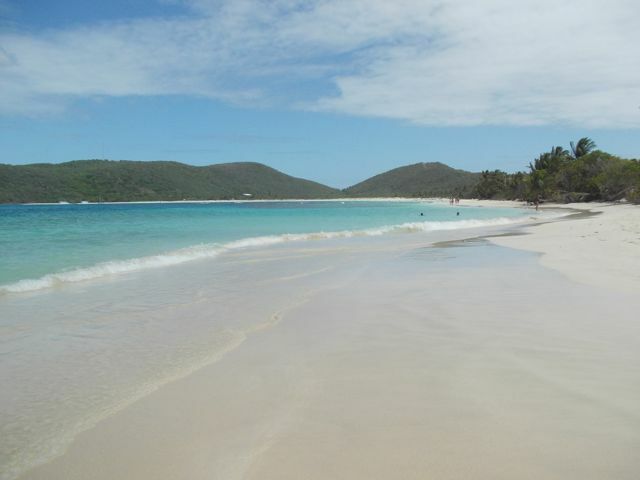 Dewey is a town, Flamingo a bay and beach; both are on the island of Culebra. 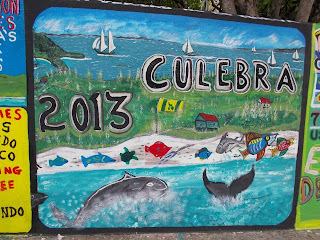 Culebra’s a little over 50 miles from San Juan, the capitol city of the big island and US territory of Puerto Rico. Dewey appears to be a local’s playground. The bulk of visitors come by ferry from Puerto Rico for a quaint, small-town experience, and maybe a hop over to family-friendly, long, broad Flamingo Beach. We appreciated Dewey’s Visitor Center, where we got great maps of all three Spanish Virgin Islands and of Puerto Rico. Refreshingly, the Visitor Center representative not only easily answered our questions about the local bus, she didn’t try to “sell” us anything. 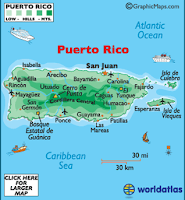 She strongly suggested checking out Puerto Rico’s El Yunque Puerto Rico’s national rainforest park (we did – watch for it in an upcoming post) based on our interests. 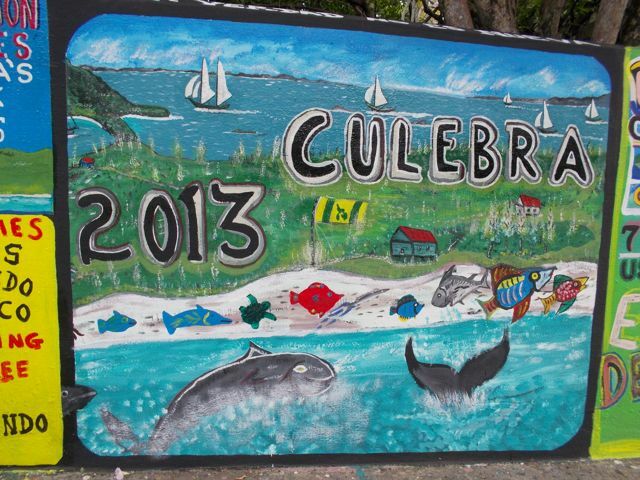 One of many charming murals around Culebra;this one was in Dewey. Dotted with restaurants, vibrant murals and colorful architecture, it was a pleasure to wander Dewey. We were equally thrilled that even the little market’s prices (there are no big markets) were in most cases even more reasonable than St. Thomas. 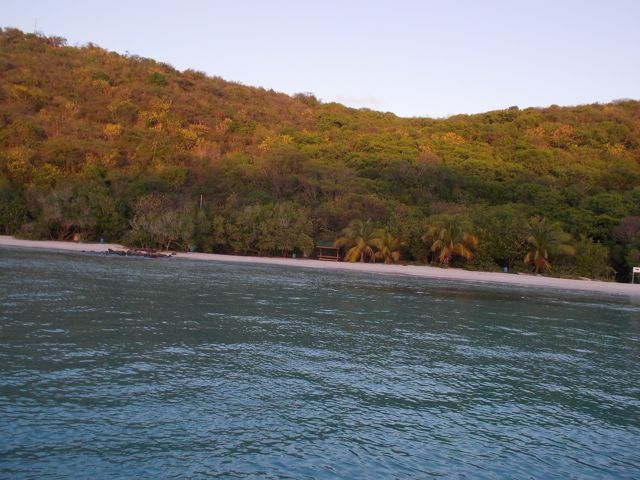 We ovenighted in Dewey, then sailed around the island to anchor in Flamingo Bay, reveling in its crystal clear water and powdery white soft sand beaches. 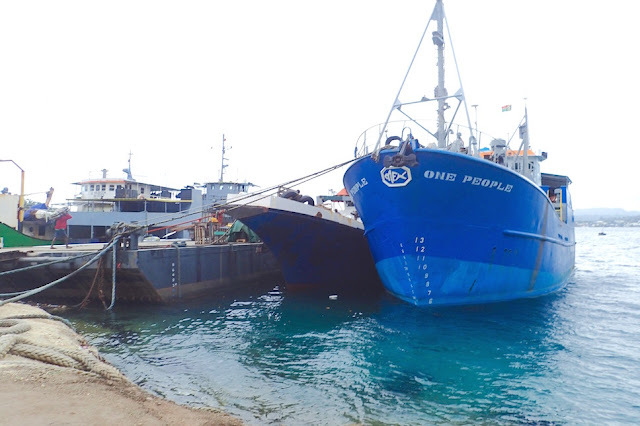 We were intrigued by two colorfully painted army tanks, one near and one nearly in the water (watch for an upcoming post on that)! Dewey and Flamingo would’ve been very short. We eyed and sniffed but didn’t indulge in the goodies, both native and mainstream Americana at the boardwalk-like food kiosks. 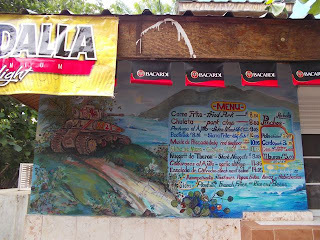 We did buy and appreciately down a cold soda, when we asked directions for a forest reserve. 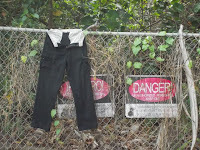 We found out we didn’t miss reserve, it was off limits, fenced off. After our long walk, I took a dip to check out the lie of our anchor chain. It was more twisted than Presidential pre-election accusations. Wayne straighted it out, re-orienting our boat with our dinghy. 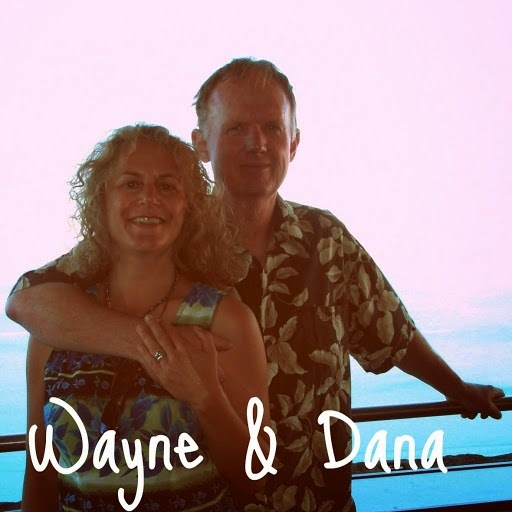 Watching, I was startled by three stingrays skimming the ocean floor next to our anchor, but not too startled to snorkel over to the nearby reef to check out the coral and other sea life. As the day died down, Flamingos Beachgoers drifted away. 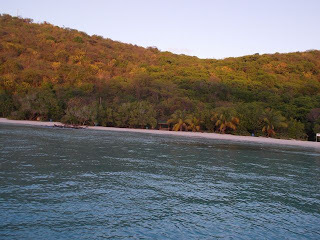 Once again, as with sister island Ilsa Culebrita (click here to read about that) we had an anchorage to ourselves. We took in the starry night sky, and howled at a magnificently near-full moon. We had no worries about disturbing the neighbors. 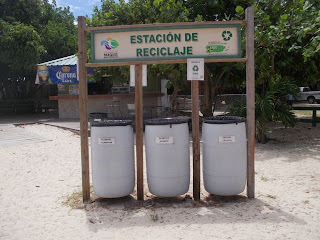 I was pleased to see recycling bins at Flamingo Beach, Culebra. 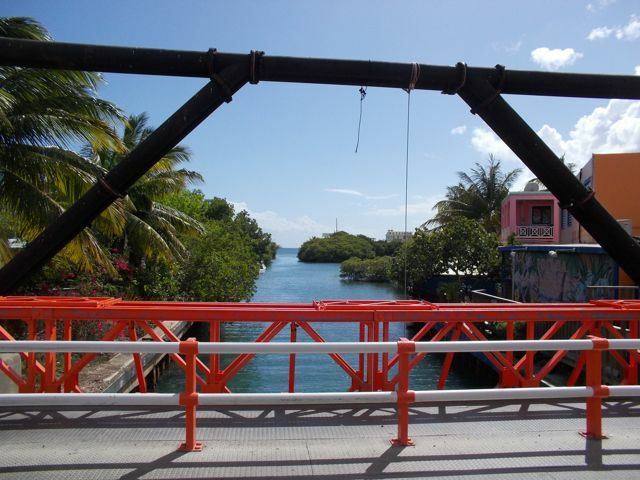 (St. Martin, St Barts, Guadeloupe). Our anchorage at Culebra’s Flamingo Beach. Rolly, but we decided, worth it.